The exploitative relationship between city and countryside pervades Chinese life. Nowhere is inequality in access to public goods clearer than in the country’s urban education system. A key element of China’s generation-long economic boom has been its ability to provide employers with a flow of cheap labor that is also relatively healthy and educated. How has such a magical combination been possible? The answer, to put it somewhat abstractly, is this: by spatially separating economic production from social reproduction, capital has been able to buy labor power at less than its value. 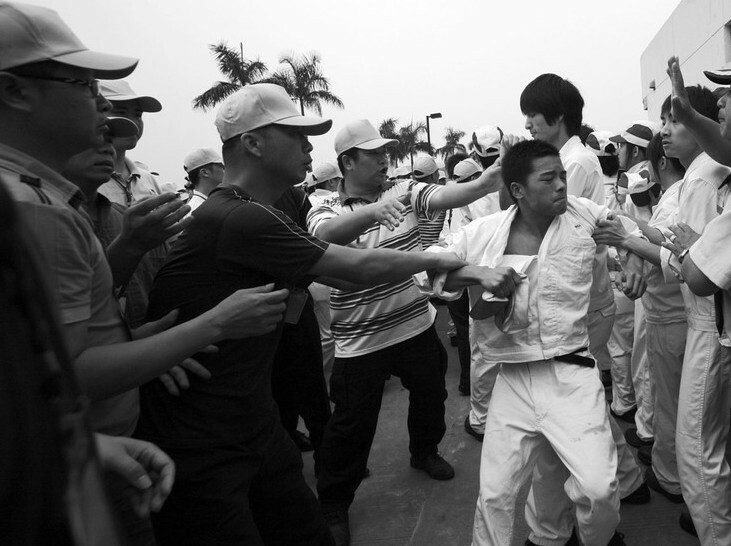 The labor of 250 million Chinese migrant workers, now the numerically and politically most important part of the working class, is largely deployed in the country’s many metropolises. But if the production of consumer goods, skyscrapers, and high-speed railways is taking place in the cities, the production of migrant labor power itself — social reproduction — by and large takes place in the countryside. That is where the social and financial costs of providing education, healthcare, and care for the aged are borne. This is a giant subsidy to urban capitalists, who are thus able to use massive amounts of labor without having to pay for either the worker’s formation or for reproduction on a generational basis. Cities have been able to consume the best working years of migrant youth and then spit them back into the countryside when they’re no longer desirable, with no further obligations. But after underwriting decades of growth, this blatantly exploitative relationship between city and countryside is starting to show signs of stress. Most importantly, young migrants to the city are proving increasingly unwilling to return to the farm to start families as their parents had done in the 1980s and 1990s. The problem, though, is that it is still nearly impossible for working-class migrants to make a decent life in the city, as they are legally excluded from the social services that urban residents enjoy. Nowhere is this inequality in access to public goods clearer than in urban China’s segregated education system. The Chinese state maintains a formally tiered system of citizenship that is enforced through the household registration system known as hukou. This system ties the provision of public goods to place: if someone leaves their officially designated hometown, the state promises them nothing. Additionally, there is a deeply unequal distribution of social goods in terms of scope and quality that is dependent on place, with residents of cities like Beijing and Shanghai enjoying far superior and more diverse services than those of their rural compatriots. This transparently unequal citizenship regime operates intergenerationally. A child born in Beijing to parents from rural Sichuan is guaranteed access to public services — but only in rural Sichuan. If the ideal of public goods is to serve as a bulwark against the market’s inherent tendency to reproduce class inequality, in China such institutions serve just the opposite purpose. This is not the informal class- and race-based segregation of today’s America, but old-fashioned, formal exclusion based on inherited characteristics. The implications for the rigidification of class structure are legion. Migrants without urban hukou face immense barriers — administrative, financial, and social — in enrolling their children in urban schools. Access for “employees who have entered the city” (as they’re referred to in the official lexicon) is generally dependent on the parents’ ability to pay massive bribes, often equivalent to one year’s salary, as well as to document stable employment, stable residence, and an extended period of residence within the city. In other words, if they can prove their usefulness to capital in the labor market, the chances of their children gaining access to public education are increased. But even if cities are unwilling to bear the costs of migrants’ social reproduction, they still need the labor. Thus, in a half-hearted attempt to allow migrants to settle down, they have allowed a wholly private shadow education system to emerge in the institutional interstices, in the hopes that parents will continue to power their factories, construction sites, and restaurants. These decrepit migrant schools that populate the periphery of every major city are little more than holding pens, crystallizing all the violence and precarity of Chinese capitalism. With little promise of quality education, migrant children are condemned to repeat their parents’ social existence, thus amounting to a fairly deliberate reproduction of surplus population. Despite the valiant efforts of many well-intentioned teachers and other volunteers, these institutions do not have the time or the money to give their students much hope of escaping the trap. China is a big country, and different cities have widely varying approaches to providing social services. Some, like Chongqing, are relatively inclusive of migrants, though even such cities maintain a sizeable second-class citizenry. But by all accounts the most exclusionary and repressive city for migrants is Beijing. That’s because the state is gripped by the biopolitical fear of overpopulation, and all the chaos that’s presumed to go with it, in the national capital, the symbolic core of the polity. Life must not get too comfortable for the subaltern, lest the capital be overrun with-social service-devouring undesirables. The differences between a migrant school and even a subpar public school in Beijing are immediately apparent even before entering school grounds. The socially peripheral status of migrant schools is mirrored in their physical location on Beijing’s periphery: as land prices in the urban core have skyrocketed due to real estate speculation, schools have been continuously pushed to the margin of the city — the place where “the city meets the country.” Migrant schools are not only a waste of space from the perspective of capital, they pose a political threat to the oppressive “harmony” that perpetually anxious Communist Party cadres are entrusted with maintaining. So these schools are hidden from sight, far from the towering monoliths of the central business district and the solemn Stalinist facades of Tian’anmen. They are tucked into narrow alleys strewn with trash and populated by mangy street dogs, seemingly a world away from the “global” part of the city. Most schools are in dilapidated single-story brick buildings, with no indoor plumbing or central heating. While the city’s public schools are all decked out in new multimedia appliances and computer labs, migrant schools often have only a single computer for the principal. Playgrounds in these schools hardly count as such — typically there’s nothing more than a potholed concrete slab that serves as a basketball court for hundreds of students at a time. In the very first school I visited, children were playing in a mound of crushed coal, subaltern Beijing’s equivalent of a sandbox. In some respects, Beijing’s migrant schools are even worse than typical privatized education, because although these schools are oriented towards generating profit, the state refuses to grant them recognition. There are more than one hundred migrant schools in the city that exist in a permanent legal gray zone, allowed to persist because they respond to a real need, but without official sanction. Private enterprises enjoy certain legal protections that these schools do not. In this sense, migrants’ shadow education system represents the dark side of autonomy from the state. And the state frequently exploits this legal precarity. Migrant schools exist under constant threat of closure. The most spectacular example came in the fall of 2011 when thirty schools were shut down and demolished under the pretext that they were unsafe and unhygienic. Whether these demolitions are driven by the economic logic of land dispossession or the political imperative to maintain an exclusionary environment for migrant labor is unclear. The salient point, however, is that migrant children, teachers, and the physical schools themselves exist in a highly uncertain environment. This ever-present uncertainty extends to the private capital that underwrites these schools. As a result, the school “bosses” (as teachers refer to their principals) use time-tested methods to ensure profitability: they squeeze the hell out of the workers. The social profile of migrant school teachers closely resembles that of their students’ parents. Most are themselves migrants and are living in the city without urban hukou. Their wages are nowhere near what is necessary to live a dignified life. Many teachers in Beijing earn considerably less than the legal minimum wage, which at approximately $200 a month is itself a far cry from a livable wage. They do not enjoy health insurance or pensions. They work illegally long hours, often exceeding seventy or eighty hours a week. Such conditions are not contractual violations, since teachers rarely have even a basic written contract. Management feels no need to abide by labor laws since the school itself is not legal. Although most teachers are dedicated to their work, they are not prepared for the classroom. Many have received no higher education, and almost none are licensed as teachers. Indeed, teachers who do have the credentials and the opportunity will almost inevitably move to public schools. But even the most diligent and capable teacher would be unable to handle the social chaos that emanates from the community and envelops the school. Everything that happens in the parents’ lives is immediately reflected in the teachers’ work. A major complaint that teachers have is that parents are simply absent from their child’s life. That is not surprising: the parents work insane hours for low pay in the desperate scramble to survive in the city. But from the teacher’s perspective, this means that they have to put in extra unpaid hours tutoring students. Sometimes parents fail to pick up their children from school. This means that some teachers will have to stay late to watch them — again, unpaid overtime. According to surveys, the most vexing problem for teachers is the uneven range of abilities among their students. And the children’s studies are as precarious as their parents’ lives. When parents lose their job, students often have to switch schools or return to the countryside. Student turnover is incredibly high, with some schools losing more than a quarter of their class every year. Under such conditions, teachers barely have the opportunity to familiarize themselves with the students. Add to this huge class sizes, sometimes in excess of fifty students, and the possibilities for transformative education become increasingly dim. Teachers around the world have to deal with their students’ physical and emotional problems, but in migrant schools these issues frequently reach a crisis level. Many students are subject to domestic violence or abandonment, forced to fend for themselves at a very young age. Many come to school with severe health issues that parents were either unaware of or simply unable to respond to. Some teachers describe how they’ve had to rush sick children to the hospital for treatment. Being migrants, the children almost never have health insurance, and teachers are forced to front the money in order for the student to receive desperately needed medical attention. This is hardly part of the job description. As in most places, these teachers say that they put up with wretched working conditions because they care deeply about their students. Most of them talk about the great satisfaction they get from seeing students develop, and tell of how their efforts are acknowledged with cards, songs, and poems packed with effusive praise and gratitude. Teachers often say that they have felt like a mother while at work. The truth of the matter is that few teachers of any gender can bear these conditions, regardless of the gratifying aspects of the work. As a result, turnover in schools is incredibly high; in one school I visited, fully one third of the teaching staff left in a single semester. It’s not unusual for teachers to leave in the middle of a semester. As a result, Beijing schools — in a move that will be familiar to Americans — have increasingly turned to volunteer labor from idealistic college students to fill the gaps. And just like their Teach for America counterparts, these volunteers are woefully unprepared for the chaos of subaltern Beijing. Migrant schools in the capital are social mayhem institutionalized: at the class level, they can only produce surplus population. Lest this all seem too gloomy, there are signs of hope: the current model of accumulation, based on the separation between economic production in the city and social reproduction in the countryside, is showing serious signs of stress. Indeed, the exclusionary policies pursued by cities over the past generation have been too successful, as many regions in coastal China have faced persistent labor shortages for years. Thus, a contradiction: while cities continue to be unwilling to pay full price for labor, workers are increasingly unwilling to accept the raw deal they’ve gotten for the last generation; they are frequently engaging in militant forms of collective resistance, or the individualized strike of staying at home in the countryside and refusing to take the jobs at all. Either the cities pay more for labor, including the costs of reproduction, or they will not be able to get the living labor they so desperately need. How this tension gets resolved will be decisive in determining the future shape of China’s urbanization and economic development, its citizenship regimes and class structures. And there are more overt signs of resistance. Although a broad-based civil rights movement has yet to emerge, migrant parents have been increasingly active in demanding equal access to education. There has been a series of street protests and petitions to the Ministry of Education in Beijing. Parents have engaged in direct action following school demolitions to demand that their children be relocated to public schools. This has resulted in cities diverting somewhat more resources to public education and increasing the number of slots for non-resident children. As with recent labor and environmental protests, we see yet again that the Chinese state is quite vulnerable to popular mobilization. And like their comrades in the factories, teachers in China’s rapidly expanding private education sector have also been militant. Despite the many social and emotional challenges inherent in a reproductive labor strike, teachers have been walking off the job in cities around the country to demand back pay or higher wages. Just like with factory workers, however, this resistance so far is highly atomized and seemingly apolitical. More speculatively, though, it’s possible to imagine a politicized alliance between migrant teachers and parents. For, as described above, the precarity of parents’ lives is directly reflected in teachers’ work. If parents win less work for more money, teachers too will benefit as they will shoulder less of the burden of reproductive labor. And an end to the tiered citizenship regime would allow both teachers and parents the possibility of a somewhat more dignified existence in the city. The demand for free and equal education for all has the potential to unite a vast swath of the population currently excluded from urban public services. Manifold social violence has been visited on the migrant working class as city governments try to maintain the spatial separation of production and reproduction, work and life. Families have been broken up, aging grandparents forced to care for grandchildren, children shuttled between countryside and city in search of decent education, schools literally bulldozed to make way for redevelopment, and teachers subjected to extreme stress and overwork. This is the social consequence of capital’s insistence on paying less than full price for labor. But while maintaining a disposable underclass may have permitted China’s explosive economic growth, state and capital may yet come to regret this model. A class with nothing to lose is a dangerous class indeed.